Private driveway access for parking several cars with lockable garage. Large master bedroom with private deck overlooking the farmland behind. Open up the large folding doors onto the deck and you have the indoor-outdoor flow. The house is cool during the day and warm at night especially in the upper bedrooms. There are beds for 11. In today's information age, it's important to be in touch. The Top Deck has complimentary WiFi for all and excellent mobile phone coverage for Vodafone and Spark users. The High Def TV in the living room downstairs will keep you entertained for hours or the kids happy when you are entertaining on the deck. There is Freeview TV Netlix and DVD Blu-ray player for sitting on the leather couches upstairs relaxing. For the more adventurous, there are stunning walks through Tihiotonga Centennial Park and Arikikapakapa Reserve. If you want to explore, a short drive will take you to the Whakarewarewa Forest (The Redwood forest), for some amazing mountain biking or walking trails. It's a 10-minute drive into Rotorua with a huge variety of pursuits. The Top Deck has a well-equipped kitchen, with new appliances. There are beds for 11, and being a large house there is plenty of room for more. Sunny all year around, quality leather couches, and with fire box (wood supplied). Good in and out driveway access. NO MORE GUESTS THAN THE STATED NUMBERS PLEASE. Heat pump with a DVS system, plus oil column heaters in bedrooms A wood burner fireplace is situated in the lounge. The basics are here but you do need to bring your own food items. milk etc. Our family of 7 (2 adults, 5 kids) stayed for 3 nights. Everyone slept comfortably in their own beds. Having 2 bathrooms we also nice. We had been traveling on holiday for 2 weeks so the washer and dryer was nice to have in the home. My kids didnt like the spiders/cockroach they saw. The property manager, Norman, was fantastic. Super responsive and accommodating. I would stay at this property again because of his efforts. We found the house very clean, spacious and well equipped. There is obviously some external maintenance that needs to be carried out and internal work to be finished, mainly downstairs, but overall we found it very good and a reasonable price for the size of the house and it’s handy proximity to the city. It was very wet while we were there but there was plenty of space for our grandchildren to play inside. 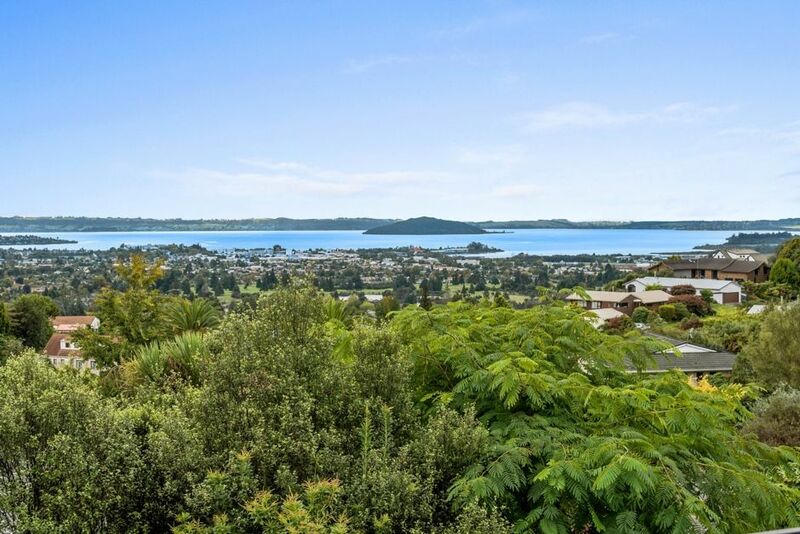 Great quiet and clean spot on top of the hill with top views over Rotorua and the lake. Had a great time with family at The Top Deck. Had all the things we needed with a clean well appointed kitchen large family room with a veranda to sit and admire the view over Rotorua and the lake and clean and spacious bedrooms. The downstairs area was great for the kids to get away from it all and have their own space. The house is close to The Redwood Forest and the Whakarewarewa Red Woods Mountain Bike Park. It's only a 5 minute drive into Rotorua and is close to the State Highway out to Taupo. Thanks for your review! Yes its a top location and well set up house for family holidays and Rotorua visits! Great home with amazing views in quiet residential area but just minutes away from the centre of Rotorua. We had a fantastic stay. The house is very spacious and we had more than enough space for two families staying. Loved staying at this property. It was in a great location close to attractions, restaurants and shops. Would recommend this property to any family. All are available in Rotorua city, which is around a 10-15k or 20 minute drive away, and limited services only once out at the lake and the property.